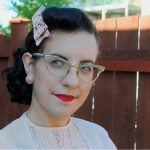 This post is the first official lesson in the Vintage Knitting College! I’m starting off with a series of posts for Colorwork: 101. 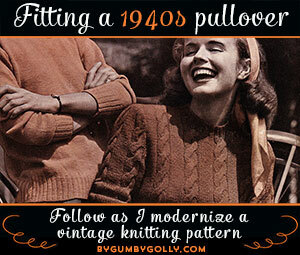 As you know, you’ll be following along with a pullover I’ll be knitting from a 1940s pattern, Bestway #82. 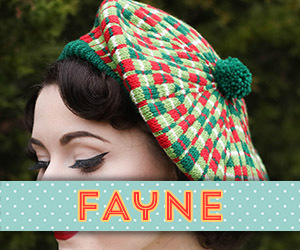 It’s available as a .pdf from the Vintage Knitting Lady here, and available for your Ravelry queue here. But since my goal for the VKC is to cover beginning and advanced techniques, and since not everything I want to discuss will be covered in one single project, I’m going to intersperse other posts with tips and techniques along the way! Today, we’ll discuss how you knit with multiples colors for stranded (sometimes called fair isle) knitting, including carrying your yarn without making a mess of it. In the next post I’ll talk about keeping even tension and making the work look nice. 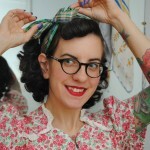 Whether you knit vintage or not, the concept is still the same. Stranded knitting refers to knitting with multiple colors in a single row, with the unused color carried or stranded along the back when it’s not in use. Hence the name “stranding” or “stranded knitting”. 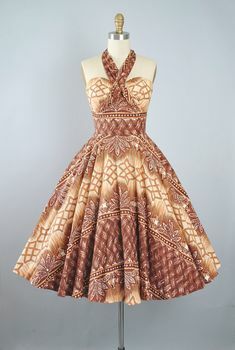 Usually, that’s limited to two colors, but you may find 3 or more colors in some Icelandic and Scandinavian traditional patterns, for example, and occasionally in vintage patterns. Though it’s most commonly done with two colors in a row, so that’s what I’ll focus on. And at first glance, it might. 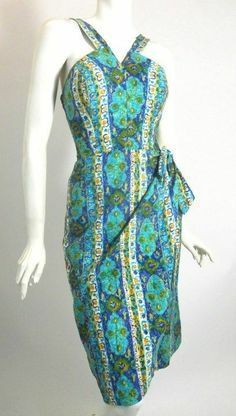 Intricate shapes and patterns, and sometime lots of colors. But what you’re looking at is just stockinette stitch. Knit on all rows if you are working in the round, or knit on the right-side rows, purl on the wrong-side rows if you’re knitting flat. All you’re doing is adding one more color per row! Sure, there is some technique to that, but when you boil it down, it’s just stockinette stitch. And if you know how to knit, you know how to do it! So you’re well on your way! The first thing you need to think about when starting a stranded knitting project is the fact that you’re dealing with two balls of yarn at a time. 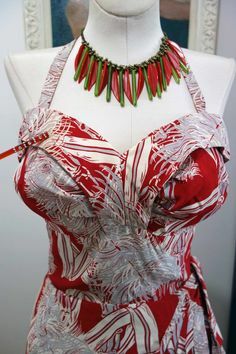 The basic idea is simple: knit a certain number of stitches in the first color, knit a certain number of stitches in the second color, knit a certain number of stitches in the first color again, etc. 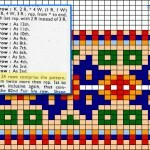 Your pattern or chart will tell you how many stitches of each color. (More on that as we get further into our lessons.) But forget the pattern for a moment. For beginners, it can be difficult to figure out what to actually do with the yarn. Where does the second strand go when you’re not using it? Where do you put the balls of yarn when you’re knitting? How do you keep two strands of yarn from turning into a big, annoying tangled mess that you want to hurl through the window? 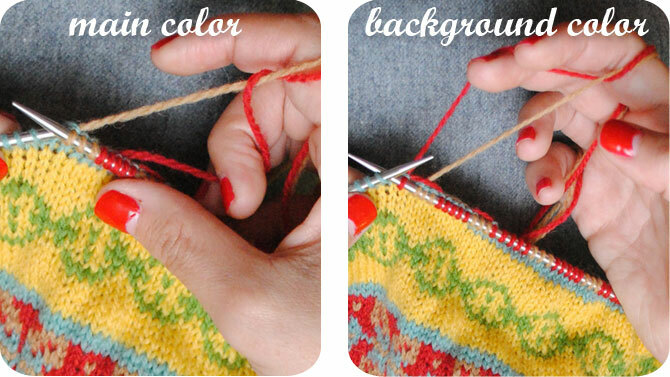 There are different ways to knit with two colors of yarn in the same row. What you choose to do is entirely up to you and what feels best in your hands! 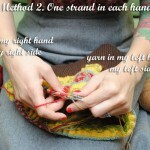 I’m going to go through three main methods for working stranded knitting. The first two are common (and you can find any number of tutorials online for each), the third is not even considered a “real” method by some, but I stubbornly maintain it is. They key is to play around with different methods until you hit on something that works for you! Don’t let anyone tell you there is a right way and a wrong way to do it. There are lots of ways. Method 1. Carry both strands of yarn in your left hand or your right hand (depending on which hand you normally use to carry your yarn). You can do this with both strands over your pointer finger, or one on your pointer finger and one on your middle finger, or whatever works best for you. 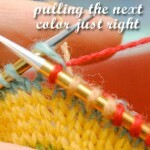 You alternate knitting with the background color and the main color. When I knit normally, I kind of hook the working yarn with my finger when I throw it over the needle, so two strands on the same hand is hard for me. I can do it, but it’s awkward and difficult for me to keep the strands from twisting around each other. Method 2. 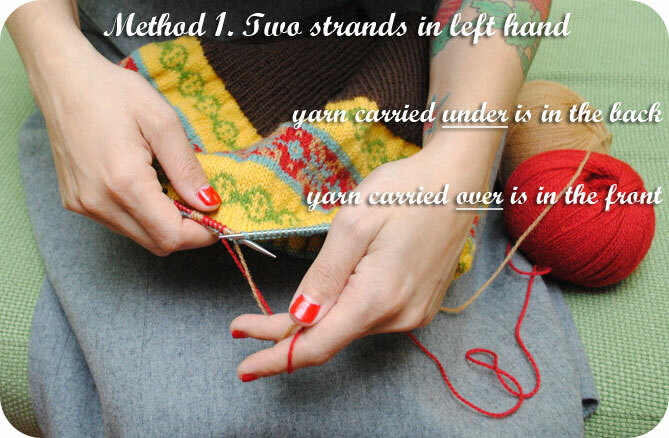 Carry one strand of yarn in your left hand, and one strand of yarn in your right hand. This means getting comfortable doing a knit stitch—and purl if you’re going to knit flat—in both styles of knitting. In the U.S., it would mean knitting both Continental style (“picking” with your left hand) and English style (“throwing” with your right hand). 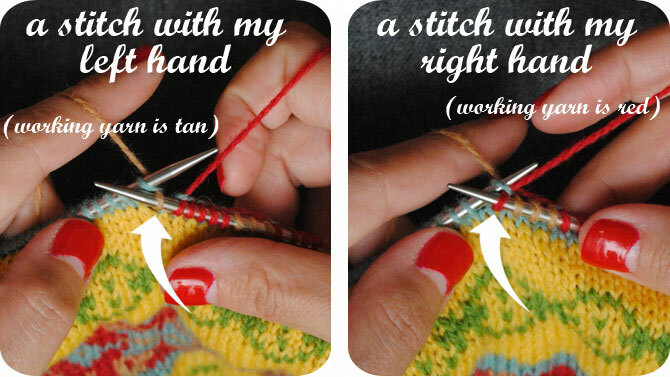 Here’s a tip: you might find that you don’t tension the yarn or carry it across your hand the same way with both hands. That’s totally fine! There’s no rule that you have to do it the same in each hand. Method 3. 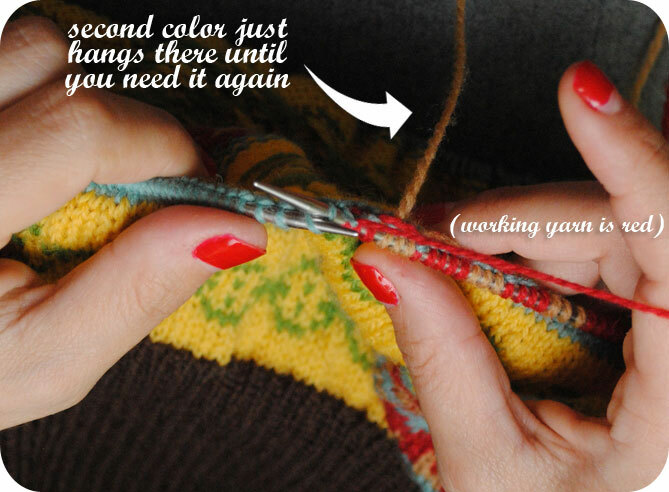 Carry one strand of yarn at a time, dropping it and picking up the next color when you get to that stitch. This means knitting with color A, dropping it, knitting with color B, dropping it, knitting with color A, etc. 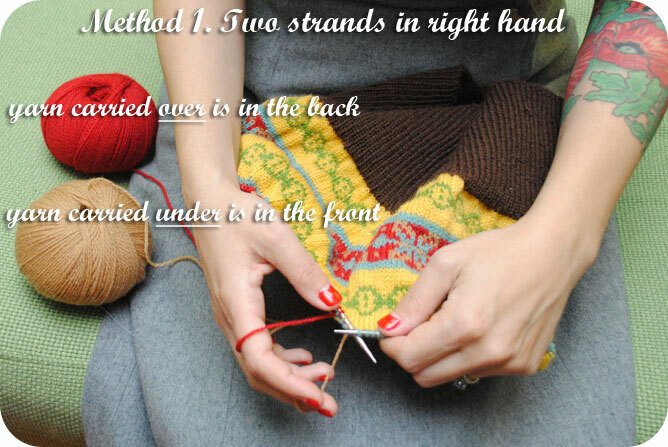 Method 3 is the one method you’ll rarely see cited as a way to knit stranded in any knitting reference. People almost never tell you to do this. They say it’s way slower and you’re more apt to make tangles with your two colors compared to Methods 1 and 2. One of my fair isle books goes so far as to say it’s the one way to carry your yarn that you should never use. What do I say to that? Malarkey! I taught myself stranded knitting using this method, simply picking up the strand I needed to use next when I got to that stitch. Why? Because it was the first thing that make sense to me. Yes, it’s a little more slow than the other methods, and a pain if you’re changing colors frequently (like every other stitch). But did it get the job done, and produce even, beautiful colorwork? Yes. In the end, that’s all that matters. If it produces knitting and makes you happy then I don’t think it’s fair to call it a “wrong” technique. Do what works for you and gets the job done. What do I do now? I use Method 2. 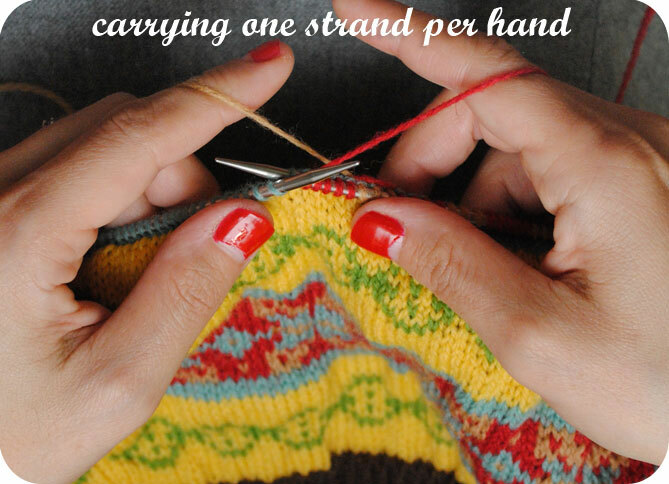 I normally knit English style, carrying my working yarn in my right hand (a “thrower” versus a “picker”). It took me a long time to learn to successfully do a knit stitch in Continental style, carrying the yarn in my left hand. 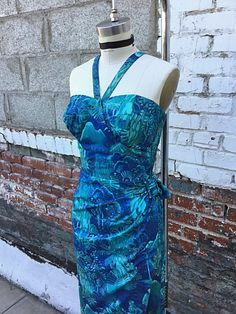 I can do it now, but I reserve it only for when I’m doing stranded knitting. I still prefer English style. It just feels better to me. 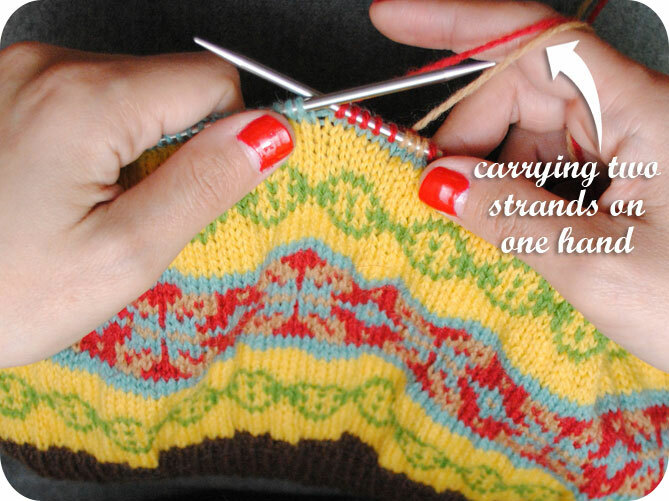 This is really important in stranded knitting and goes hand-in-hand with carrying your yarn. If your yarn is a tangled mess all the time, you’re going to get frustrated quickly. The easiest way to keep things tangle-free is by being consistent. When you knit (no matter what method you select for knitting with two colors) you always want one color to go over, the other color to go under. And you want the same color doing it every time. When you’re knitting, you’ll see how this works out, with one color over and one under. 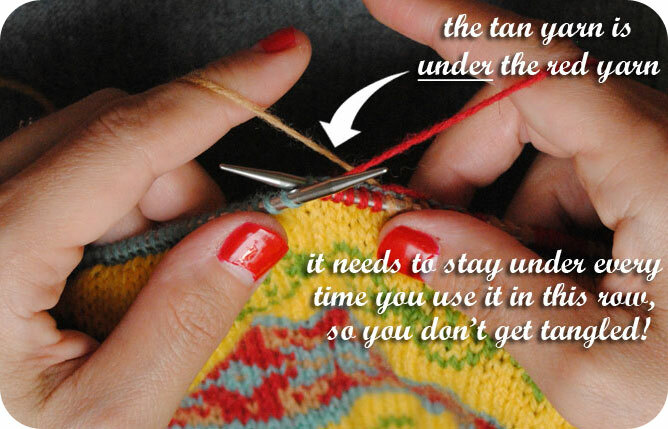 In a row where you’re knitting with red and tan, if red goes over and tan goes under, do the same consistently across the entire row. If you mix that up, your strands of yarn will start to twist around each other and you’ll find yourself untangling yarn a lot. And that’s just a pain. If you still can’t visualize why it mattes, consider how you braid/plait hair. You always have to keep the location of each strand the same, or you won’t end up with a proper braid. If the right strand goes over the middle strand once, but then goes under the next time, and over after that a couple of times… well, the strands will get messy. Same thing with yarn. Be consistent! It may look confusing now, but when you start knitting, you’ll understand how the yarn can get twisted and tangled if you’re not consistent. 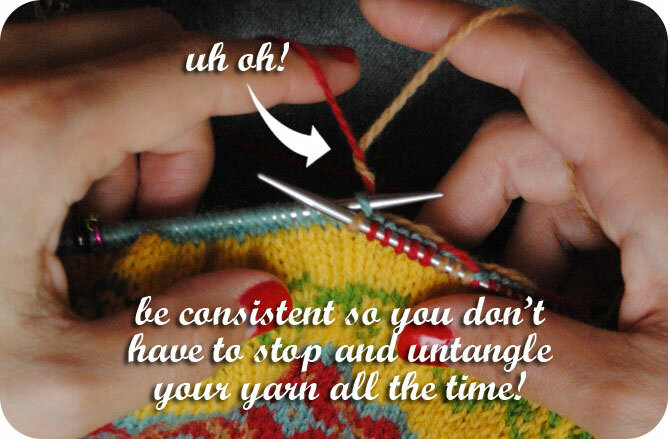 Not only will being consistent mean you won’t be spending half your time untangling two balls of yarn, in the long run your knitting will look better if you’re consistent. Why? Because, one of the colors will dominate just slightly over the other color. Most people feel it’s the yarn that is carried under that ends up more dominant (as a sliiightly bigger stitch is made that way), and thus make sure that’s the pattern color, not the background color. Either way, that consistency leads to a more visually balanced piece of knitting. Consistency is a big step. But the second is ball juggling. Almost literally. Where do they both go? To your left, to your right, one on each side? Do you move them around? If you knit with Method 1 (carrying two strands in one hand), you will have to be diligent about keeping track of your yarn. You can try placing one ball on either side of you, but you might find it feels awkward with the second color pulling across your lap. If so, keep them both on the same side you carry your yarn. If you’re carrying both strands in your left hand, it’s easiest to have the color that goes under in back. If you knit with Method 3 (picking up and dropping each strand), your best bet is like Method 1, to place both balls of yarn next to you on the same side you carry your yarn. 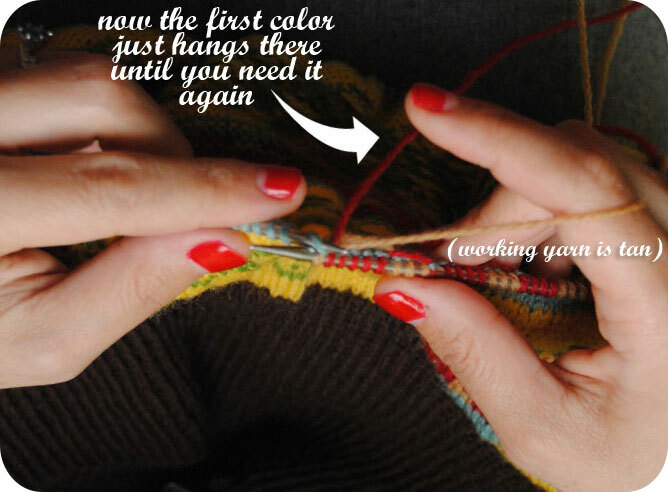 Just like in Method 1, If you carry yarn in your left hand, it’s easiest to have the color that goes under in back, and if you carry yarn in your left hand, it’s easiest to have the color that goes under in front. I think that’s enough for one post! In the next post in Colorwork: 101, I’ll talk all about tips for actually knitting with two colors of yarn, now that you get the general idea for how to manage your yarn. I’ll focus on how you master tension so your colorwork looks good. That’s one of the trickiest parts about stranded colorwork. 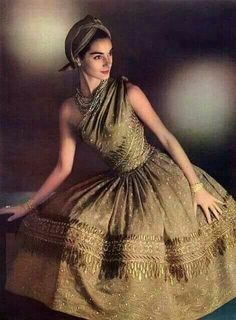 Topics coming up soon after that will be color theory with a vintage perspective in mind, and how to deal with color charts, vintage stranded patterns, and vintage patterns that are uncharted! Okay so far? I expect some bumps in the road as we go along, so please let me know if you have any questions or concerns. I’ll try to address them in the comments or dedicate separate posts to them when that makes sense. I’m sorry I don’t currently have a way to show you these methods in video after my fiasco with the video camera not working out. 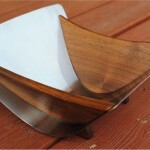 But if you’ve followed my blog for awhile you know my penchant for detailed photos, so hopefully we’ll be okay. 😉 And of course, at the end of each lesson I’ll point you to other resources that I find helpful. 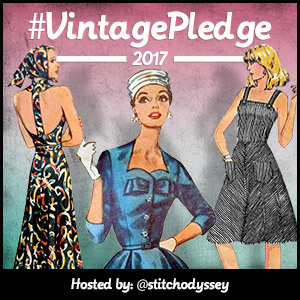 Side note #1: Now that I’m starting in on the actual lessons, I’ll be updating the Vintage Knitting College page with links to each post. I’m still figuring out how exactly I’ll organize it all, which will probably change over time as the VKC grows. 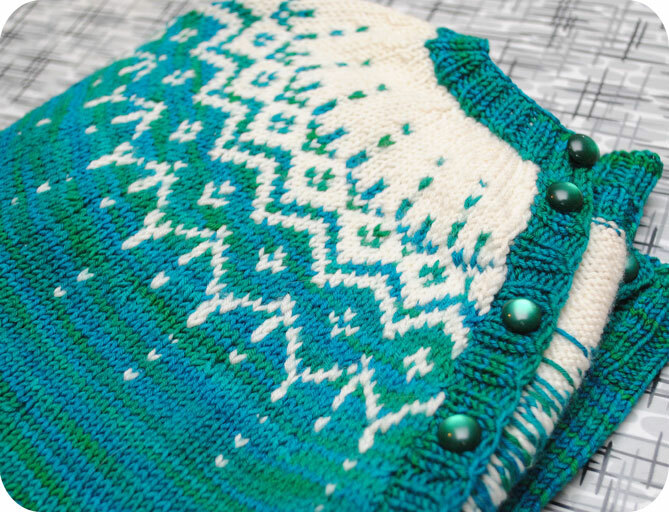 I’ve done a tiny bit of stranded color work, but this post of yours was enlightening! I never knew about the dominant color nor did I know that I should be keeping the background color in one hand for the whole project. In the past I always put the dominant color (for any given row) on my dominant yarn holding hand (my left for continental knitting). So you can imagine that my work isn’t very consistent. Thanks so much for sharing all of this wonderful info (and links too). Your pictures are quite excellent! I didn’t miss a video, at all. 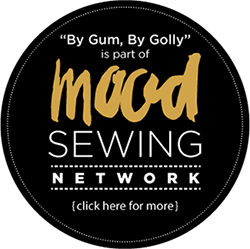 I am so excited about this – you have perfect timing! It’s about time I learned to do colour work, and I’m so keen to see what you have in store…. Thanks Tasha – you are awesome! Heck yeah, this is awesome! I could have used this lesson when I started out doing stranded color work, and it’s only the beginning! Very excited to see what’s to come, and to see that sweater you’ve got too! OMG, I actually understood this, and have already used method #3 without knowing it! 🙂 On a beginner’s project, even. I was making the obligatory newbi dishcloth and the pattern called for changing color mid-row to make a checkerboard pattern, and said to not cut the yarn. Of course, it didn’t say how to go about doing this so I just guessed. I’ll back you up that method #3 is legit! Have you ever thought about making video tutorials as well? This is FAB! 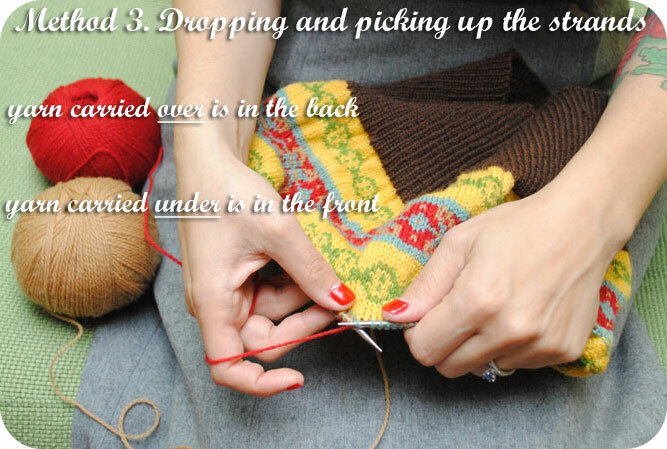 What a great and comprehensive guide to stranded knitting! 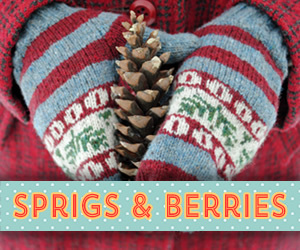 I’m proud to be a two-handed knitter, but I do confess to getting my wools in a twist so this is a great help! 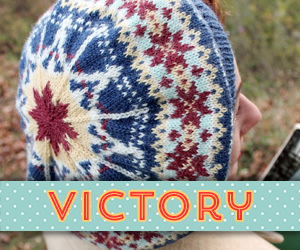 How many Fair Isle projects do you have going right now? 😉 There’s the cardigan and this – and which goes with the beret? The colors are so gorgeous on all of them & I can’t wait to see how they look all finished up. Very nice interview over on Kestrel Finds btw. And I fell in love with the pink elephants sweater all over again! So glad this is helpful! @Kestrel Thanks, I’m actually wearing it today at work! I love these colours together. 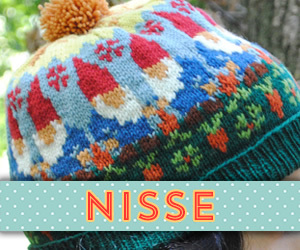 You’ve set me off wanting to do some Fair Isle now – maybe the mits I was promising my daughter last Winter. I was reading Comments on Maryjane’s weekend market experience when I came upon your Comment. Thought it worthy of a trip to look-see. Am so glad I did ! ! ! ! I can not believe my luck to find your VKC. I’m so excited to get started with you. Your explanation is so clear, concise that I’m wondering why I was intimidated. Just as soon as I calm my nerves I’ll go about Following/Subscribing – whatever it takes to continue on this adventure with you. How could I get so muddled???? ?’cause I’m on my first cuppa of the day? Gail, is the gal. That’s where I ready your Comment and Gail’s response. I love Gail and her many, many creative talents. btw, I put your button on my sidebar. Hope a few more knitters come you way. So, Tasha, it’s all your fault. You already got me hooked on knitting in the first place with your Briar Rose KAL and now you inspired me to starting my first Fair Isle project … I’ll never get any sewing projects done in the future because I’ll have to knit all the time 😉 . 1. How do you start the new color, is there a way of “fixing” the yarn a little bit, because the first stitch is very loose when you just let the yarn end hang down. 2. How do you manage the 2 yarns on the purl side? My sweater will be knit in the round up to the armholes, but the sleeves and the upper part according to instructions will have to be knitted and purled. I tried it on the gauge swatch, but it’s very awkward to handle. 1. The best way to start off new colors is to tie the new color onto the old color and snug the knot up to the needle to keep it tight. You don’t have to do a full knot, i.e. like twice, that’s up to you if you don’t mind a knot at the back of your work when you weave in ends (I don’t really care personally). Thanks Tasha. I read about steeks … cutting into my knitting is sort of freaking me out a little bit though ;-). 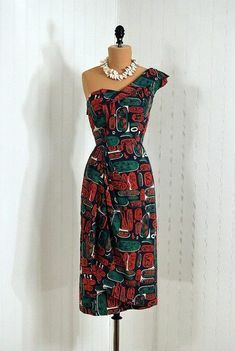 It’s going to be a while until I reach the armholes, so I’ll wait for your next posts for further details. I thought about tying the new yarn on with a knot, but somehow was of the opinion that “one doesn’t do that” … silly, isn’t it? It’s the same as with your method 3: If it works for me, it’s ok to do it. Who cares about a knot at the back of the knitting … I surely don’t. Thank you once again for all the work you are putting into this, your explanations are so detailed and really really helpful. Very informative! I never would have thought to use one hand for each color. I’ve just started to have a go at colourwork for the first time ever, so this is invaluable info for me. Thanks so much! Thank you so much for your posts! Like a few of the other commenters above, I just began tackling colorwork so your posts are incredibly helpful – also I adore the patterns/designs you are working with, the colors are beautiful! Thanks again and please keep up the great posts! 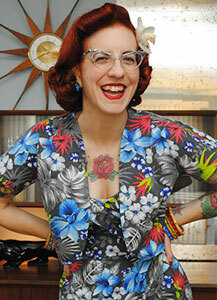 Wow I love the way you explain things & your pictures are excellent (is that your tatoo? awesome!). I also like that you’re open minded about different techniques and that people need to find the method that works best for them. I love Fair Isle knitting and have been doing quite a lot lately though I haven’t seemed to settle on one particular style. I knit English style most comfortably (in fact, I resent the term “throwing” as I knit quickly in this method & nothing about what I do resembles throwing to me… ) but I have experimented with continental style. I sometimes use both methods together for Fair Isle but I’m concerned about the tension being the same so I sometimes resort to one strand at a time depending on the frequency of the color change. I’m SO EXCITED about this!!! 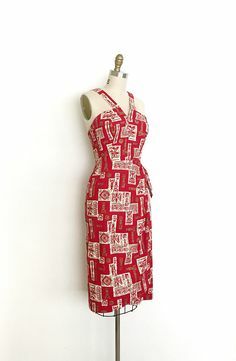 I have been thinking very hard about how to knit clothing and patterns and such, but I had NO idea where to start! This is ridiculously helpful, thank you! I’M knitting with 3 colors on straight needles,how do I carry the 2 colors not used when I’m on a pearl row and using only main color.Sorry if I did not explain y difficulty clearer.I’ve seen many tutorials but only on circular needles,what am i missing????? This is the most comprehensive guide to stranded knitting that I’ve ever seen… thanks so much for all the tips! The photos are great. They make each technique especially clear. I’ve never been totally happy with my stranded work before, and after reading this I feel like I have lots of new things to try out to get it looking better. THANK YOU!! for the clear and easy fix for my colour dominance issue! 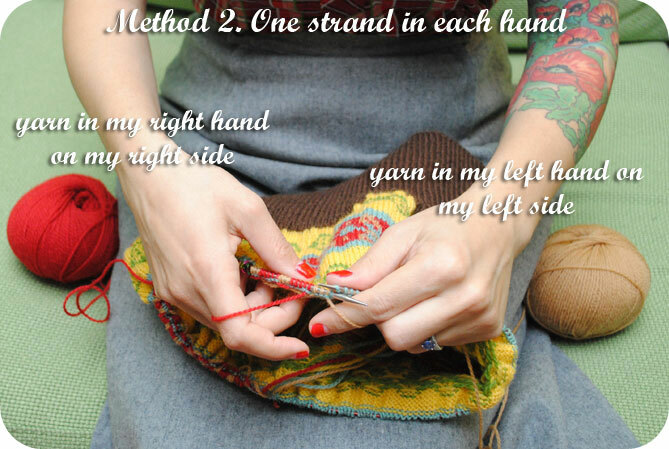 I am a “Method 3” knitter, & this is the first explanation I’ve found that made sense to me. 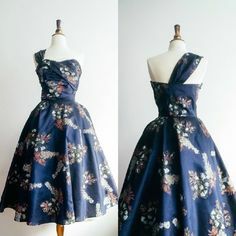 Are there no other patterns that you have or tutorials,!I’ve been receiving this same one forever,have learned the technic and just wondering if I’m missing out on other great things that you do.